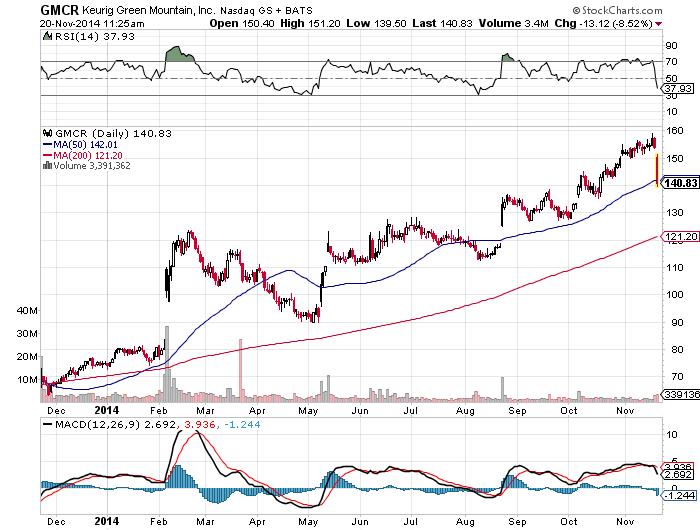 Keurig Green Mountain, Inc. (NASDAQ: GMCR), announced today a price increase of up to 9% on all portion packs sold by Keurig for use in its Keurig® brewing systems and on all its traditional bagged, fractional packs, and bulk coffee products. This price increase will be effective beginning November 3, 2014. So Keurig has opted to fight any threat to its margins. It will not be easy. Until now, Keurig’s profit margins on K-Cups have been very attractive. Profits from the Keurig coffee machines are probably small or nonexistent, which means that the EBITDA margin on coffee alone is higher than the 24% group-wide EBITDA margin. And within coffee, the margin on K-Cups is higher still, which explains GMCR’s 5x price to sales ratio and its $23bn market cap. The problem going forward is that competition will only increase, putting pressure on market share and on margins. I sum it up through three main headings: K-Cups, Machines and Nestlé. If you collect enough coffee from K-Cups to fill a one-pound bag, you will have spent anywhere from $25 to $50 in K-Cups. That could be well over twice the retail price of bagged coffee, which itself already enjoys a hefty markup. Put another way, if I prepare my daily coffee using K-Cups and a Keurig machine, it will cost me anywhere between 60 cents to over a dollar per cup. But if I buy bagged coffee and EZ-Cup Filters, it could cost me say 25 cents for the coffee and 10 cents for the filter, all together about half the less pricey K-Cup option. The bottom line is: coffee sold in K-Cups costs a lot more than the same amount of coffee sold in bags (to do the math, 1 pound = 453.6 grams). 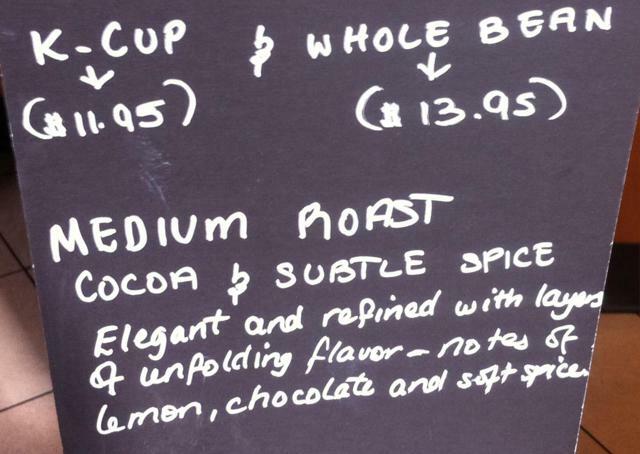 In this photo taken at a coffee shop, the same brand coffee is selling for $13.95 per pound and for $11.95 for a box of 12 K-Cups, each weighing 12.9 grams. Pound for pound, the K-Cup coffee costs 2.5x the bagged coffee. Some premium is certainly justified for processing, grinding and packaging K-Cup coffee, but 2.5x looks like a very generous markup. This large price difference creates an opportunity which puts Keurig margins at risk. If I were a manufacturer instead of a consumer, I could buy coffee wholesale for less than 25 cents per 10-gram serving (the amount of coffee in most K-Cups appears to be in the 9 to 12 gram range), put this coffee in compatible cups or filters and sell it at a tidy profit while still undercutting Keurig prices. The large Keurig markup means that there is ample room for competitors to enter at various price points and still derive a profit. None of this has gone unnoticed. As many as 14% of K-Cup compatible pods have come from private-label suppliers (other estimates are closer to 10%). The remaining 86% come from Keurig’s own brands and from Keurig licensees (Starbucks SBUX, etc.). Keurig believes that the 14% will decline and that the 86% will grow. But the opposite is just as likely because competition does not usually decrease when margins are large for a product which is being progressively commoditized. There will certainly be more competition at lower price points in single serve units whether they are called K-Cups, pods, capsules, or something else. This company for example offers tiny suppliers (as small as individual coffee shops) the opportunity to package their coffee into Keurig compatible cups, starting with very small volumes. Going forward, one could buy single serve cups from Keurig or a Keurig licensee or buy them from a favorite coffee shop at about half the price. In the end, modularity always wins… You can predict with perfect certainty that if Apple is having that extraordinary experience, the people with modularity are striving. You can predict that they are motivated to figure out how to emulate what they are offering, but with modularity. And so ultimately, unless there is no ceiling, at some point Apple hits the ceiling. Granted this is long-term theory. In the near term, as the good times continue, Keurig can be described as a marketing rollup. In a traditional rollup, a company grows by acquiring several of its peers sequentially over a period of years. It brings its expertise and economies of scale to its acquisition targets and benefits from their improved profitability. In a marketing rollup, a company convinces several of its peers to join its platform by promising to sell their product at a higher price and splitting the benefits with them. Keurig has clearly been masterful at deploying this strategy, selling its own and third-party coffee at a premium. Keurig has also been masterful at announcing new partnerships frequently and methodically, in a way that has so far been hugely beneficial to the stock price. There is a measure of genius in this management who have not only convinced millions of Americans to pay more for coffee in return for some convenience, but who have also convinced investors that new technology can make a huge difference in the erstwhile mundane task of preparing a cup of coffee. This explains why Keurig’s stock is today very near its all-time high. A visit to Bed Bath & Beyond’s website shows that there are now several competing single-serve coffee makers on the market. Some of them like Cuisinart, Mr. Coffee and Hamilton Beach use K-Cups. Others like Nespresso use different capsules. You can now bypass Keurig machines and Keurig coffee brands by buying another machine and by using private label cups. You can choose, from a growing number of alternatives, to enjoy a single-serve cup of coffee delivered with the convenience of a K-Cup (or similar pod) without paying the Keurig company a single dime. The notion that Keurig can reverse this trend is, in my opinion, unrealistic. Still, the company is giving it a good try with the Keurig 2.0 machine. It includes a carafe and some proprietary technology which will only work with Keurig-approved K-Cups. This means that an unlicensed K-Cup does not work in a Keurig 2.0 coffee maker. A key question for the future is whether Keurig’s market share in K-Cups will erode further or whether it will reverse and trend back towards 100%. I expect that it will erode further. The restrictive Keurig 2.0 is in theory a good attempt to rebuild the walls surrounding Keurig’s ecosystem, but it does not appear to offer the consumer something truly new and exciting. It does offer the ability to brew a single K-Cup and/or larger batches into a carafe but this is something a consumer can already do with a traditional coffee maker sitting next to a K-Cup machine (made by Keurig or someone else). Keurig says that a large number of US households have not yet switched to single serve and that their main reason for staying away is that single serve machines do not brew large enough batches of coffee. This may sound like circular logic to justify a plateauing in single serve penetration, but Keurig believes that there is a broader target market for a machine that offers the convenience of both the single-serve and the larger carafe bundled in one product. Except for saving a small area atop the kitchen counter (not an issue in most American kitchens), it is not clear what the consumer is getting in the bundled product that he does not already have. Notwithstanding the above and judging from the stock’s performance, the market seems to have accepted the success of 2.0 as a foregone conclusion. This may be overly sanguine if Amazon reviews are a good indicator. All three Keurig 2.0 machines available on Amazon have consumer reviews below three stars out of five. By comparison, the older Keurig machines have nearly five stars. Pricing of Keurig 2.0 machines may be an important determinant of success and needs to be low enough to be competitive with the alternative, which is to own two machines (one single serve, one carafe) for less money and with fewer restrictions than the Keurig 2.0 bundle. In theory, Keurig has a large potential for expansion outside North America. Today, Keurig’s revenues come from the US and Canada. But the company has recently started to expand into foreign markets, beginning with the United Kingdom. Yet, nothing is as easy outside one’s own home turf. It is not uncommon for a growth consumer company to stumble soon after its entry into a foreign market. In addition, by going overseas, Keurig is entering a world dominated by the giants of global coffee, Nestlé and Mondelez. They too have ambitions beyond their largest markets. Nestlé is redoubling its efforts in the US. The Swiss company is the world number one in coffee with 22.7% market share, in part because most of the world drinks instant coffee where the Nescafé brand is dominant. Nestlé is already present in single-serve coffee with its Nespresso machines and capsules. Nespresso is dominant in Europe but, in the US, it has lagged Keurig by a long mile because it was slow to adapt to American preferences. Compared to Keurig, Nespresso machines have had higher retail prices and, in the past, have served smaller cups of coffee which are more suitable to the European taste. Although Nespresso has introduced newer machines which can make espresso and larger cups of coffee, it still does not appear to have a product in the US that is designed to take Keurig head on. That could change soon if it is serious about gaining significant share. We can be confident that competition will intensify here and overseas. But what is of greater importance is the current debate on open vs. closed systems. An open system allows other coffee brands on your machine (for example Starbucks, Dunkin Donuts etc). A closed system does not. As discussed above, Keurig allows a large number of licensees and a wide portfolio of non-Keurig coffee brands on Keurig machines, all of which bolster the case that Keurig offers an open system. A truly open system however would allow other coffee brands on the machine without extracting a fee from them. So Keurig can be called semi-open (or semi-closed), or open only to the extent that it can obtain a fee from third parties. Nespresso has been even more restrictive, allowing only Nestlé coffee capsules on its machines. But Nespresso recently lost a ruling in France which forced it to open its machines to other capsule makers. France is Nespresso’s most important market and if Nestlé has accepted that it will run a completely open system in France, it is likely that it will run an open system everywhere. What this means is that there will be more coffee companies making capsules for Nespresso machines. More importantly, it could also mean that these companies can do so without being licensed by Nestlé. If this new openness migrates to the US, it will result in a new headache for Keurig which is trying to remain semi-open (or semi-closed) through its licensing policy and the proprietary technology of Keurig 2.0. From the point of view of the consumer, a completely open system makes the most sense because it will lead to greater choice, greater competition and lower prices. And as we have seen, prices are high enough that they can fall significantly and still deliver a profit. Because of its global footprint and large portfolio of brands in other categories, Nestlé could likely sustain pricing pressures in US coffee for longer than Keurig could. Nestlé’s annual coffee revenues dwarf Keurig’s ($16 billion vs. $4.5b) but they amount to less than one fifth of total Nestlé revenues. This is where a large global player like Coke could be helpful to Keurig. But the question remains how much Coke should pay for the rest of Keurig? And when should it make its move? 1. Coke makes a move fairly soon and offers only a small premium or no premium, arguing that the stock has raced 50% from $80 to $120 and beyond after the acquisition of its initial stake. In other words, the premium is already included in the current stock price. 2. Coke makes a move in a few weeks, months or years at a higher price. By then, the performance of Keurig stock will be largely justified by its own operations and Coke will have to offer a premium to the then stock price. So say that by then the stock is at $170 and Coke will have to offer $200+. 3. Coke makes a move in a few weeks, months or years at a lower price. This could occur if Keurig’s results deteriorate and the stock falls back towards $80 before the bid. Although investors are excited about scenarios 1 and 2, a trade buyer would normally prefer scenario 3. Why pay $200 per share when you can pay $80 instead? That $120 difference amounts to a $19 billion difference on the current share count. In February, Coke could have easily bought all of Keurig, given that Coke’s market cap was then over twelve times the market cap of Keurig. The fact that it did not bid on all of Keurig outright could suggest that it viewed the stock as overvalued. Or it could suggest that it needed more time to get comfortable with the prospects of Keurig Cold. With a choice to act now or wait longer, it may be wiser for Coke to wait longer given the mounting uncertainty facing Keurig. In addition to the competitive challenges discussed above, rising coffee prices could exert further pressure on margins. Severe droughts in Brazil have resulted in the price of Arabica coffee soaring from $1.10 to $2.10 per pound in the six months to May 2014. It then dipped to $1.60 in June as suppliers sold down their inventories. But the depletion of these inventories boosted the price back to near $2 as of now. The onset of a new El-Nino effect has some predicting a further increase to $3 per pound. Keurig is hedged for 2015, but at higher prices than for 2014. As noted above, it will try to pass on some of these increases to consumers but from $30 per pound equivalent for K-Cups, it is not clear whether consumers will accept the increase or migrate to lower-priced private labels in greater numbers. Keurig’s rich pricing and margins are not sustainable in the face of rising competition from Nestlé and private label suppliers. Keurig’s management have done an excellent job bringing the company to where it is today. But competitive pressures are mounting and a full bid from Coke is already priced in. At 20x 2015 EBITDA, the stock looks stretched. This article only represents the author’s opinion, may include unintentional errors, and is not meant to influence the reader’s decision to trade Keurig stock long or short. Do your own work, read more research and draw your own conclusions. If you short the stock, you should be cognizant that 1) Keurig has been very adept at boosting its stock price despite declining revenue growth and 2) a full bid from Coke could come at any time.